Every Lean promoter and advocate knows that the adoption of Lean management is in business leaders’ interests, not against their interests. The interests encompass that of the business itself and all its stakeholders: employees (executive and non-executive), suppliers, customers, investors, communities, and even competitors. Yet, business leaders, over some 30 years, have delivered a clear and consistent message: Lean management is not in our interest; we are against it. 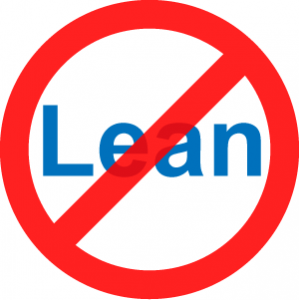 As a result, we see widespread use of Lean tools but very few Lean transformations. We see widespread engagement among professional staff, but little engagement among executives (because they are happy with the status quo) or wage earners (who are afraid to change because they are hanging on to what little they got). We see small gains in productivity and cost reduction, but we see few examples of the big gains that result from continuous flow and just-in-time. Wage earners and professional staff may have legitimate needs with respect to doing their job, which Lean management can actualize, to help the business grow and become more successful. But, those needs will go unfulfilled so long as the budget owners view them, the primary beneficiaries of redistribution, as inferior. Therefore, undeservingness fully justifies zero-sum economic, social, and political outcomes. So even though the continuation of Classical management does broad harm to the many – humanity, the economy, the environment, and so on – executives continue to vote for it because it serves their interests in avoiding redistribution. This explains why efforts to “sell” Lean management to business leaders are destined to fail. The logic of business (money-making) and the logic of Lean (technical logic) are not aligned. One word “because of their EGO and just short term financial targets” No real need to change. Hi Bob, Thanks for your article. I agree with your argument, but would add that the situation is not helped by some ‘lean’ consultants who only push the lean tools to executives who are only too willing to embrace what they believe to be a silver bullet. Then when they see that implementing the tools in absence of developing their people – not that they are aware of this latter deficit – does not provide the results they expected, or were promised, declare lean to be a failure. Steve: The issue of pushing lean tools is the consultants fault, not the leader. The consultant has a responsibility of clarifying how TPS will impact the business, and how to sustain and improve on their own. Unfortunately, often times, the consultants push the tools because that is all that they know. Tony you are spot on!